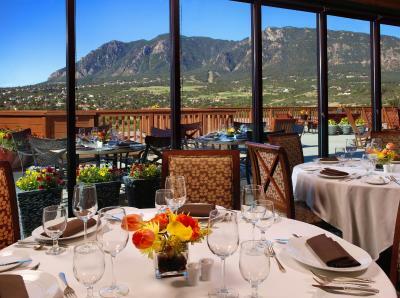 Lock in a great price for Cheyenne Mountain Resort Colorado Springs, A Dolce Resort – rated 8.6 by recent guests! Nice customer service, but I feel I was up sold after been told I could pay 30 extra a night for and upgraded room. The room was pretty lackluster, old, paper then ceilings. I liked the amazing views and the cleanliness quality. We did not have the Breakfast. The restaurant was closed. Bed was comfortable after I killed the slidet and could go to slr. The resort was beautiful. The view of the mountains gorgeous. the bedding was very nice. We did not eat at the hotel. The view was beautiful! Food was excellent; service super, every body around smile at you it was a tremendous great experience. 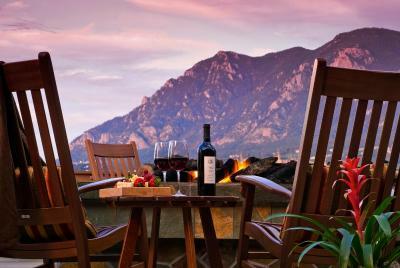 Beaitiful views, cozy deck with firepit facing the mountain. 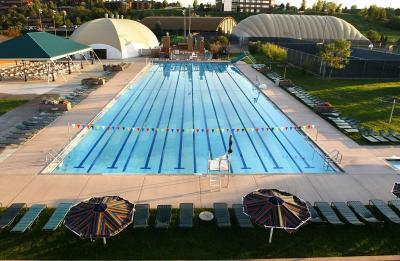 Staff was very helpful esp. 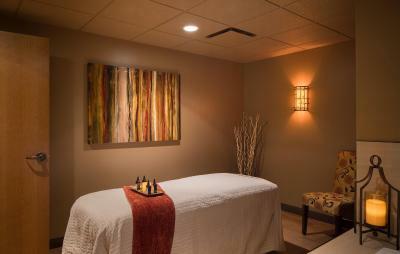 Jonathan; nice spa/fitness area. The beds were quite comfortable. Dinner was great. Room service was fast. 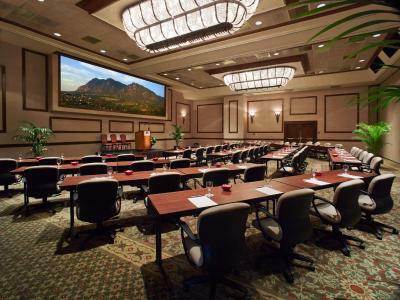 Cheyenne Mountain Resort Colorado Springs, A Dolce Resort This rating is a reflection of how the property compares to the industry standard when it comes to price, facilities and services available. It's based on a self-evaluation by the property. Use this rating to help choose your stay! 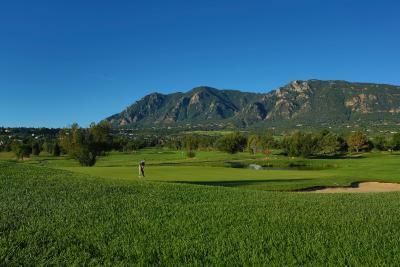 One of our top picks in Colorado Springs.Featuring views of Cheyenne Mountain, Cheyenne Mountain Resort offers championship golf, 5 swimming pools, indoor and outdoor tennis courts and a 25-acre lake for sailing. 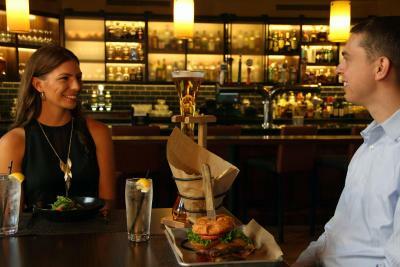 Guests can enjoy a meal at the restaurant or a drink at the bar. Every room at this resort is air conditioned and comes with a TV with cable channels and a private bathroom. For your comfort, you will find free toiletries and a hairdryer. 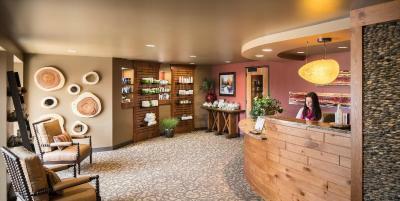 Alluvia, the full-service spa, offers massages, facials and more treatments. 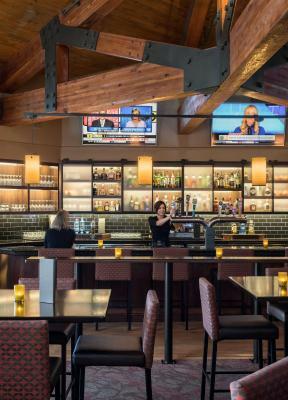 Mountain View Restaurant offers fresh cuisine and guests can enjoy a cocktail at Elevations Lounge. 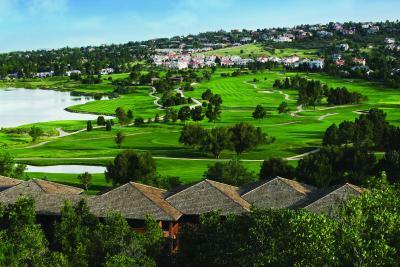 Pineview Grille features views of the golf course and serves lunch and dinner. 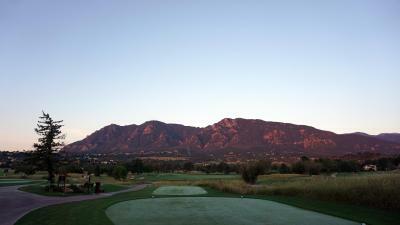 Peterson Air Force Base is 5.6 mi from Cheyenne Mountain Resort, while Garden of the Gods is 6.8 mi from the property. 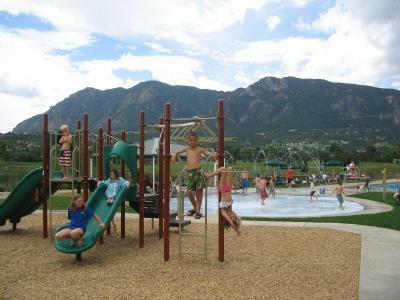 The nearest airport is Colorado Springs Airport, 6.8 mi from Cheyenne Mountain Resort. 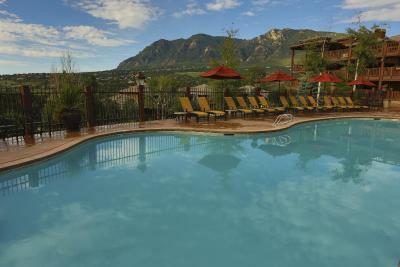 When would you like to stay at Cheyenne Mountain Resort Colorado Springs, A Dolce Resort? Featuring free Wi-Fi and cable TV, this room includes a balcony. This suite features 2 balconies, a living room with a sofa bed and a flat-screen cable TV. There are also 2 full bathrooms. This room features air conditioning, a flat-screen cable TV and a private bathroom. This room has a balcony or patio, a seating area with a sofa bed and a flat-screen cable TV. A private bathroom is also included. This suite has air conditioning a flat-screen cable TV and a separate seating area with a sofa. 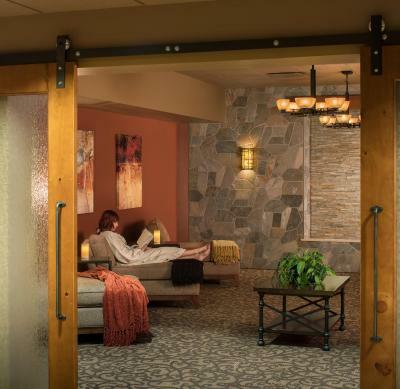 House Rules Cheyenne Mountain Resort Colorado Springs, A Dolce Resort takes special requests – add in the next step! 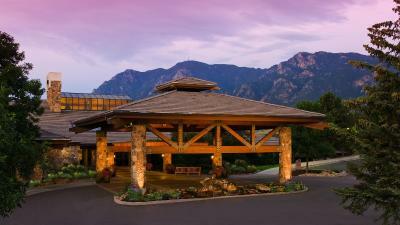 Cheyenne Mountain Resort Colorado Springs, A Dolce Resort accepts these cards and reserves the right to temporarily hold an amount prior to arrival. I loved everything about it just have a concern. The tun in the bathroom may have a leak? Otherwise my stay was fantastic! The serenity of being by nature. No hot water in my room. Poor room service. In the D building The bathroom had a ring in the tub. The door barely opened or shut all the way. This was supposed to be the upgrade that I paid for. If the shower ran in another room I could hear it. If people walked or ran in my case across the floor I could totally hear that too. For the money a terrible place. 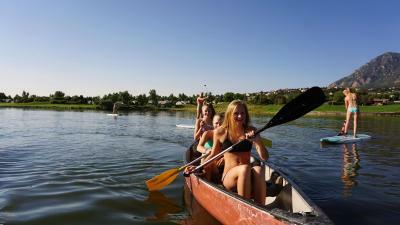 I paid around 400$ for two nights and to be honest I expected more activities to be provided by the resort. No free breakfast for the cost of rooms. Were locked out of hotel room two times because of card programming issue. Hole in the wall; thermostat laying on cooling unit; faucet not attached to sink - moved around when turning faucet on and off; two of the pillows had a bad stench; dark hall with no light by closet. They were doing remodeling at hotel but we were told our room had already been remodeled. Guessing someone should be following up after the remodeling to ensure all work done. Hotel was much better before the remodel. The jets on the hot tub did not work the whole weekend. We still used it and enjoyed it but no sign or anything apologizing We had reservations for the brunch at the hotel and with less than 24 hrs notice they called and stated they would not be serving brunch. Very disappointing, leaving us scrambling to find another place. We did not have a blow dryer in our room. Beds were so old and uncomfortable mattress, air did not work and very warm in the room.